American Illustration-American Photography (AI-AP), the leading juried annuals in North America, honors the best work being created today in Latin America. AI-AP, well-known for 32 years as the exclusive resource for art directors, designers, photo editors, art buyers and publishers seeks to introduce established, emerging and student Latino illustrators and photographers to the North American market - and vice versa - in a global, multi-cultural exchange of art and ideas. 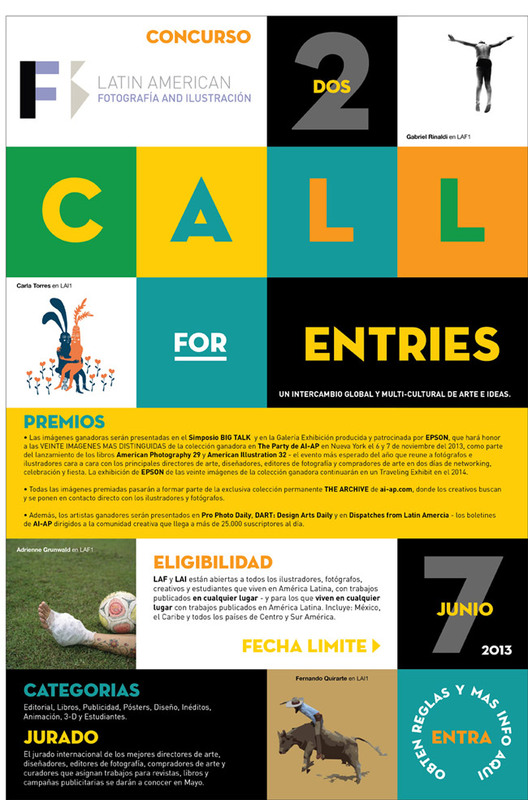 Latin American Fotografía and Ilustración will be judged by an international jury of top creatives who commission illustration and photography for use in magazines, advertising, books, posters, packaging, promotion, and video. Unpublished, fine art and student work will also be eligible. The collection of winning Latin American Fotografía and Ilustración images will be presented at the annual American Illustration-American Photography launch party in New York City in November 2013 - the most anticipated networking event of the year that brings photographers, illustrators and creatives together to celebrate the year's winning images. Presentation at the AI-AP events in New York City, November 2013. Exhibition at Photoville, Brookly NY, September 2013. Winner's slideshow announcement sent to AI-AP's 30,000 global email subscribers. Inclusion in The ARCHIVE, our exclusive, searchable web gallery at: www.ai-ap.com which receives over 200 unique visitors daily. Images will include illustrator's and photographer's contact, caption and creative credits. Features in DART: Design Arts Daily, Pro Photo Daily and Dispatched from Latin America, our three AI-AP newsletters sent to over 25,000 subscribers. Traveling exhibit in North and South America through 2014.
signature loans . Cialis Professional online is capableto release you reliably from the erection problems, its improved formula gives the new properties to the drug.